A variety of drivers and policies (or the lack thereof) shape food systems (fig 1). Food systems worldwide face major challenges, such as population growth, globalisation, urbanisation, and climate change. Agricultural, economic, trade, environmental, and international development policies create incentives, and disincentives, for the production of particular types of food. Rural development, urban planning, and transport policies affect what food reaches which consumers and at what price. Many factors influence consumers’ dietary behaviours, from personal—such as culture, knowledge, skills, dietary preferences, and time for food preparation—to economic and political—such as the cost or availability of food. Information about food, whether through education or marketing, also influences choices. Marketing, labelling, and policies that impact on price all affect consumer demand. Economic and social protection policies determine whether vulnerable populations can access healthy and sustainable diets. The nutritional quality of the foods available in the places we live affects the health of people and the planet. 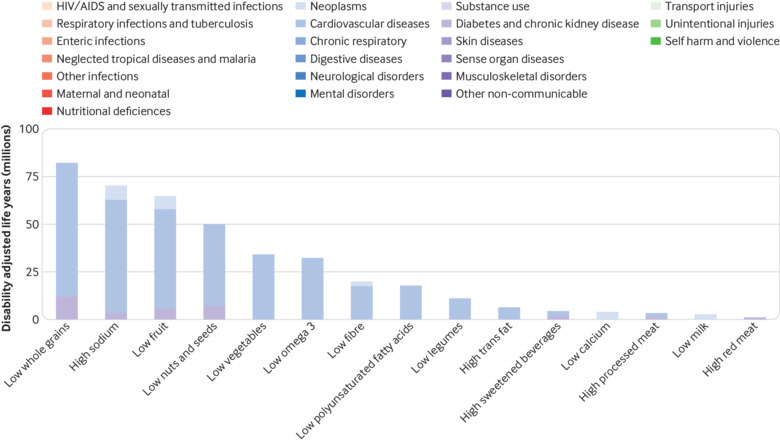 As well as human loss and suffering, malnutrition and diet related NCDs pose a substantial economic burden (fig 5). Countries face the implications of a workforce that never reaches its full productive potential, as well as the costs of treating and managing long term NCDs. Families are affected when wage earners cannot work or healthcare costs push households into poverty. Real progress to prevent diet related NCDs across the life cycle requires radical food systems transformation so that nutritious, safe, affordable, and sustainable diets are available to all. Food systems and the infrastructure on which they depend must be restructured. Reforms to the supply side of food systems in order to improve the availability of healthy sustainable diets are needed—from research and production through to processing, storage, transportation, marketing, and retailing. Food, agriculture, and trade policies—which were often originally devised to ensure quantity rather than quality of food—must remove incentives to produce less healthy foods and create incentives to produce diverse and nutritious foods using sustainable practices. Investment must be made in green transport, storage, and distribution infrastructure to give access to perishable, nutrient rich foods, such as fruits and vegetables. Measures that affect demand for certain foods—what we buy, how we prepare it, and what we eat or throw away—are urgently needed. These should include actions to create healthy food environments, supported by nutrition education, especially in schools,1819 to ensure that even the most vulnerable people can access healthy diets. Taxes and subsidies—along with regulatory measures on food composition, marketing, labelling, and nutrition standards for food in schools and other public institutions—are among the tools available. 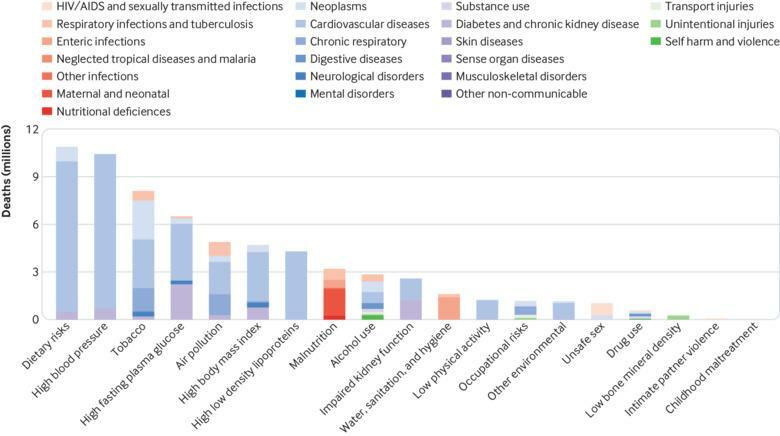 Although it is increasingly clear what needs to be done, less than a third of countries have fully implemented measures recommended by WHO—such as restricting marketing of unhealthy foods to children, taxing sugar sweetened drinks, or banning industrial trans fats (see box). Commercial interests, including the agri-food and drink industries, have large budgets to use on a variety of tactics—from lobbying decision makers to stirring public resistance—to undermine public health policy.20 Mechanisms are needed to protect governments against vested interests and ensure partnerships are in the interest of public health. The challenges of achieving policy coherence and implementing multisectoral action across governments—in the face of competing priorities and budgetary constraints, short term political gain, and lack of accountability—should also be acknowledged, along with the challenges of collecting reliable data to inform policy and report on progress, or its lack. The role of activists in advocating for strong nutrition action, building public support, and holding government to account on their commitments is vital. While most countries report having dietary guidelines, labelling legislation, media campaigns promoting healthy diets, or nutrition counselling through primary healthcare,23 they could do more to create healthy food environments. School nutrition programmes can ensure children access diverse diets needed for healthy growth and development, while limiting their exposure to unhealthy foods, and can even work towards broader development goals. Brazil, for example, introduced nutrition standards for school food that require at least 30% of school food budgets to be spent buying from local family farmers. We thank Karen McColl, Lina Mahy, and Jørgen Torgerstuen Johnsen for their contribution to this paper. Contributors and sources: FB, AL, SO, VA, GS, RR, MA, and AA all participated in the drafting and reviewing of the paper. FB coordinated the overall preparation of the manuscript. AA analysed the data and provided the respective figures. All have read and agreed to the final version. The corresponding author attests that all listed authors meet authorship criteria and that no others meeting the criteria have been omitted. The authors alone are responsible for the views expressed in this article, which does not necessarily represent the views, decisions, or policies of WHO or the institutions with which the authors are affiliated. Competing interests: We have read and understood BMJ’s policy on declaration of interest and have no relevant interest to declare. World Health Organization. World Health Statistics 2018. 2018. www.who.int/gho/publications/world_health_statistics/2018/en. World Health Organization. 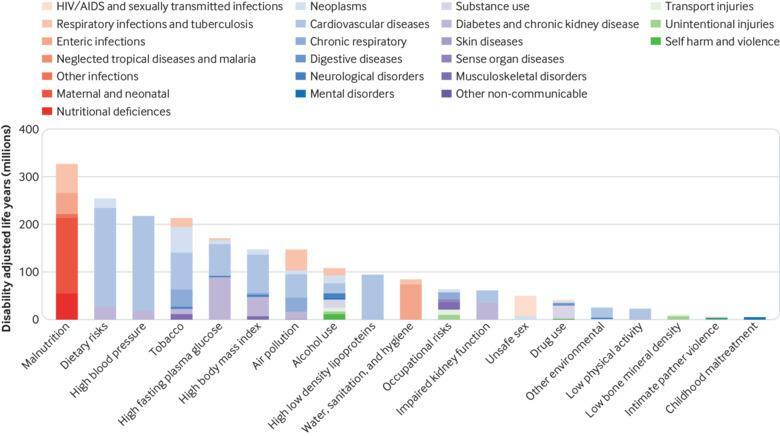 Noncommunicable diseases. Fact sheet. 2018. www.who.int/news-room/fact-sheets/detail/noncommunicable-diseases. Global Panel on Agriculture and Food Systems for Nutrition. Food systems and diets: facing the challenges of the 21st century. 2016. http://glopan.org/sites/default/files/ForesightReport.pdf. Food and Agriculture Organization of the United Nations, International Fund for Agricultural Development, Unicef, World Food Programme, World Health Organization. 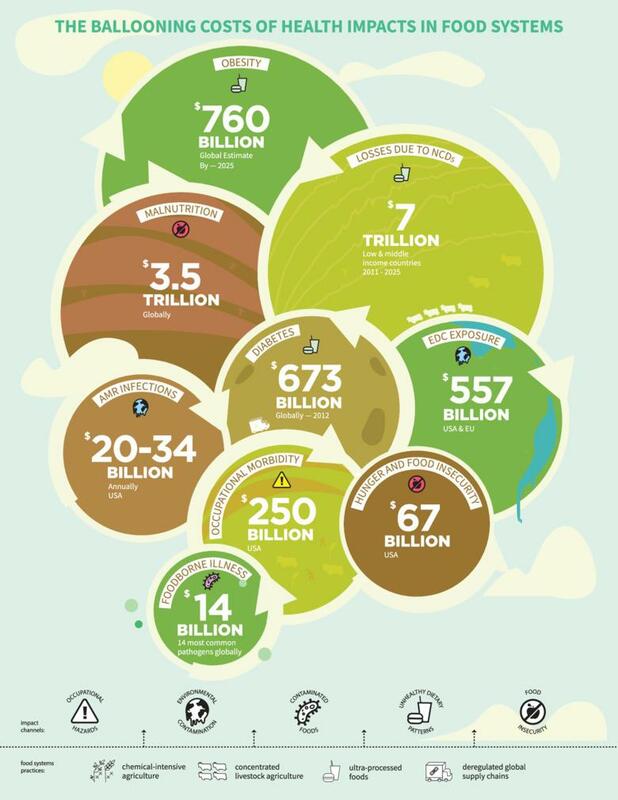 The state of food security and nutrition in the world 2018. 2018. www.fao.org/3/I9553EN/i9553en.pdf. United Nations System Standing Committee on Nutrition. Non-communicable diseases, diets and nutrition. 2018. www.unscn.org/uploads/web/news/document/NCDs-brief-EN-WEB.pdf. World Health Organization. Global nutrition targets 2025: stunting policy brief. 2014. www.who.int/nutrition/publications/globaltargets2025_policybrief_stunting/en.
. Concepts and critical perspectives for food environment research: A global framework with implications for action in low- and middle-income countries. Glob Food Secur2018;18:93-101. Unicef. From the first hour of life: making the case for improved infant and young child feeding everywhere. 2016. www.unicef.org/publications/index_93027.html. World Health Organization. Obesity and overweight factsheet. 2018. www.who.int/news-room/fact-sheets/detail/obesity-and-overweight. World Health Organization. Diabetes fact sheet. 2017. www.who.int/news-room/fact-sheets/detail/diabetes. Institute for Health Metrics and Evaluation, University of Washington. GBD compare data visualization. 2016. https://vizhub.healthdata.org/gbd-compare.
. Unravelling the food-health nexus: addressing practices, political economy, and power relations to build healthier food systems.Global Alliance for the Future of Food and IPES-Food, 2017.
. Comparative analysis of environmental impacts of agricultural production systems, agricultural input efficiency and food choice. Environ Res Lett2017;12:6 doi:10.1088/1748-9326/aa6cd5.
. Farming with nature: the science and practice of ecoagriculture.Island Press, 2012.
. Guerra PH, Nobre MR. The effect of participation in school-based nutrition education interventions on body mass index: a meta-analysis of randomized controlled community trials. Prev Med2013;56(3-4):237-43 doi:10.1016/j.ypmed.2013.01.011. Food and Agriculture Organization of the United Nations. Rome declaration on nutrition. 2014. www.fao.org/3/a-ml542e.pdf. World Health Organization. Heads of state commit to lead response to beat noncommunicable diseases, promote mental health. 2018. www.who.int/news-room/detail/27-09-2018-heads-of-state-commit-to-lead-response-to-beat-noncommunicable-diseases-promote-mental-health. World Health Organization. Global nutrition policy review 2016-2017. 2018. www.who.int/nutrition/publications/policies/global_nut_policyreview_2016-2017/en. World Health Organization. Assessing national capacity for the prevention and control of noncommunicable diseases: report of the 2017 global survey. 2018. www.who.int/ncds/surveillance/ncd-capacity/en. World Health Organization. Global database on the implementation of nutrition action (GINA). 2018. www.who.int/nutrition/gina/en. World Cancer Research Fund. NOURISHING Database. 2018. www.wcrf.org/int/policy/nourishing-database. WHO. Viet Nam breastfeeding campaign normalizes practice, improves rates. 2016. www.who.int/en/news-room/feature-stories/detail/viet-nam-breastfeeding-campaign-normalizes-practice-improves-rates.